The M112 POD House by Paris Renfroe of Paris Renfroe Design (PRD). This 1:12 masterpiece is constructed of solid exotic woods, sliding Plexiglas doors, concrete finishes and corrugated aluminum deco metal. 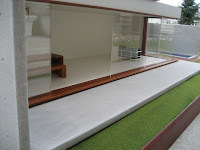 There's an open floor plan, modern landscaping, a deck, a balcony terrace and even a lap pool. What you see here isn't even the finished product. Paris is also building stairs, a Poliform kitchen and a Minotti sectional for the living area. You can watch the complete evolution of this house here. The structure is 57" L, by 24" D. The base comes in two pieces 28"L x 24"W and the top unit is 14" D, by 40" L, by 11" H. The interior height is 8" H. The second story is 28"L x 14"W x 11"H.
This will not be the only venture that PRD takes to the 1:12 world. 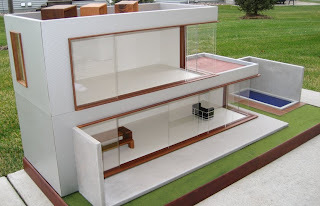 PRD will be creating more modern dollhouse designs based on a concept of stackable pod units. 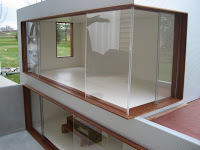 Additionally, the company will create custom dollhouse units based on a client's budget. And I really thought I was joking when I said I would be broke by the end of the year. Sigh. this is just unbelievable! amazing!!! OMG! Seriously love this guy's work. Can't wait to see more possible designs he comes up with. I LOVE THIS HOUSE!!! I'm going to need to get a bigger place so I'll have room to add one of these to my dream collection. Holy cow! That's an amazing dollhouse! wow are you really getting it?! I wish I was getting this house but I am not. I'm really really trying to keep myself under control with my collecting. I am hoping that Paris will sell his modern kitchen design though. Yes there are! You can do a search in my blog for "M112" or visit Paris' site via the link in the right frame. It sold for $1,700 on ebay. I'm a big fan too! Can't wait to get a house from him.